For my New Year's Day dinner, the first of the decade (! ), I started by making my lime-marinated jerk seitan. I bought a new type of seitan that came in strips, and used the whole box. I let the strips marinate in the juice of a quarter lime then sauteed, in coconut and not olive oil, the strips for about 3-5 minutes over medium-high heat till slightly crisp. I removed the seitan from the oil and sprinkled mild Pluto's Caribbean Bliss seasoning on the strips. I put the seitan in a bowl into the toaster oven preheated to 300°F to keep warm. I added a little more coconut oil to the pan and started sauteeing, again over medium-high, a half onion cut into a 1/4" or so dice. After a minute or so, I added about ten quartered Brussels sprouts. After 3 minutes or so, I added a half dozen spears of asparagus, cut into 3/4" lengths. Finally, about 2 minutes later, I added quartered roasted chestnuts, stirred to heat the chestnuts for just a half minute or so, then added the seitan, stirred, and served. It was delicious! 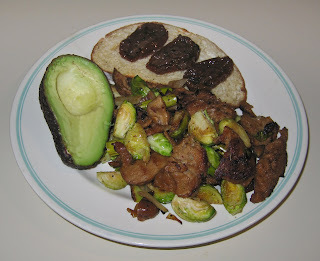 The chestnuts added an unusual texture and mild flavor addition, and the seitan was perhaps better than usual, since it was sliced fairly thin out of the box. I also served half of an avocado, and toasted some potato-onion bread, putting sundried tomatoes on top. Not a bad start to the year!